Summertown is about a mile and a half north of Oxford city centre, reached by Banbury Road or Woodstock Road. Strictly speaking, its boundaries are Squitchey Lane and Islip Road to the north, the River Cherwell to the east, Marston Ferry Road to the south and the Woodstock Road to the west, but it is usually taken to include the streets further north as far as the ring-road, the streets between the Woodstock Road and the Oxford canal and the new houses that have been built on the far side of the canal. The Woodstock and Banbury Roads, and Middle Way, were once just three of several rough tracks that led down to the city walls at North Gate. Before the settlement began to develop in 1820, the only building of note between here and the centre of Oxford was an inn, Diamond Hall. This stood on the east side of Banbury Road, roughly opposite the end of Thorncliffe Road. By 1760 Diamond Hall was notorious as a den of highwaymen, and at the end of that century it was replaced by Diamond Cottages, which still survive today. By 1832, about 500 people were living in Summertown, in a mixture of modest houses along the east side of Banbury Road, and a few larger houses standing in sizeable grounds. These were the homes of successful tradesmen, such as butchers and grocers, whose businesses served the growing needs of the city and university populations. 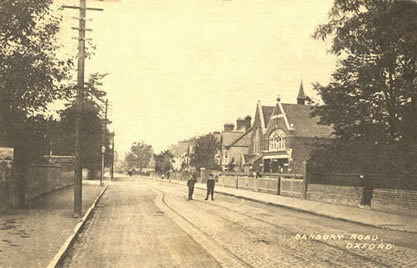 A postcard from 1905 showing the corner of Banbury Road and South Parade to the west and the United Reform Church and what was the Summertown branch of the Oxford grocery firm Twinings to the east. Southlawn, 267 Banbury Road. Built in 1822. This large house on the north corner of Banbury Road and South Parade had an orchard behind it. It was demolished in 1960. Prama House now stands on the site. Summerhill, 333 Banbury Road. Built in 1823 by John Mobley, a butcher. This house is still standing. The Avenue, 302 Woodstock Road. Built in 1823. This was once the home of Summertown’s first developer, George Kimber. It was demolished in 1964, to make way for Bishop Kirk School. This too was demolished in 1994, and replaced with a new housing development. The Firs, Middle Way. Built in 1824 for Joseph Bates, a nurseryman. It was demolished in 1961 and Martin Court stands on the site. The Lodge, 304 Woodstock Road. Built in c.1840 and owned by a grocer. This house is still standing. Northern House, South Parade. Built c.1840. The gardens of this house are now the Alexandra Tennis Courts, and the house is a school. Summertown Vicarage, Banbury Road. Built 1878. This large house and its garden, on the south corner of Banbury Road and South Parade, formed the vicarage for the church of St John’s, which stood on Middle Way where Dudley Court is now. The church was replaced by St Michael and All Angels in 1909, and demolished in 1924. The vicarage was demolished and replaced first by a garage, which was converted in 1970 into shops and offices and renamed Suffolk House. Towards the end of the 19th century the houses in the streets between Banbury and Woodstock Roads began to be built, not according to a formal plan, but in random groups. This accounts for their mixed architectural styles. As the city spread northwards from the centre, Summertown was now no longer a separate village, but joined to the northern edge of the city. The houses on the west side of Banbury Road, where the shops are, originally had front gardens. Gradually some of these residents converted their front rooms into shops and the front gardens were absorbed into the street. Today they form the slip road used for parking. A major employer in Summertown in the mid-20th century was Oliver & Gurdon, a cake factory on Middle Way. The business was begun after the First World War, and by 1939 employed about 100 pepole. Its prize-winning cakes and puddings were exported worldwide. About 200 people were working there by the time the factory closed, in 1975. The main factory building is now called Summertown Pavilion and is used as offices. The 1960s brought enormous changes to Summertown, which had until then retained its architectural diversity and village atmosphere. Many of the older houses were demolished, to make way for new office blocks such as Mayfield House and Prama House. Other new amenities such as the library (1960) and the Ferry Sports Centre (1971) arrived. In the last years of the 20th century Summertown evolved into the vibrant shopping, business and residential centre that it is today, a prosperous suburb to an historic city.